The March 23rd performance of Mary Kathryn Nagle’s Sliver of A Full Moon drew an overflow crowd to the Institute of American Indian Arts (IAIA) in Santa Fe, New Mexico. With a cast of nineteen, including 10 Yale College students, this production of Mary Kathryn Nagle’s dramatic reading about the reauthorization of the 2013 Violence Against Women Act was a collaboration between multiple institutional partners, including the Institute of American Indian Arts Performing Arts Department; the Yale Group for the Study of Native America (YGSNA); the Yale Indigenous Performing Arts Program (YIPAP); and the Yale Native American Cultural Center (NACC). Yale’s Ethnicity, Race, and Migration (ER&M) Program also helped in coordinating this event. 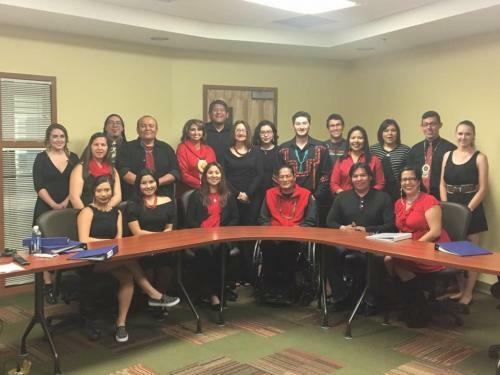 Held in the IAIA CLE Commons, the event was introduced by IAIA Performing Arts Chair Daniel Banks and IAIA Academic Dean, Charlene Teters. Several professional actors (including Ernie Tsosie, Kim Gleason, Kelly Byars, Kenneth Ruthardt, and Venita Yawakie) as well as one student from IAIA’s Performing Arts community also participated in the cast (Benishi Albert), along with three survivors, Lisa Brunner (White Earth), Billie Jo Rich (Eastern Cherokee) and Diane Millich (Southern Ute), all of whom testified in Washington, DC about their abuse at the hands of non-Indians in the movement to reauthorize VAWA. IAIA student Lee Honie joined the cast and played music throughout the show. Nagle directed the production and also led sets of rehearsals beforehand on the IAIA campus. An award-winning playwright, Nagle serves as the Executive Director of YIPAP. The March 23rd production came nearly one year after the play’s performance at the Yale Law School, its first performance within an academic community.